The commute to work is most likely done for th season, but who know for sure. The trade off is going to the Y for some weight and cardio training. Riding bikes just did not do anything for the weight. Also, there are lots of road bikes lugging around some very big bellies which reinforces the need to do something else to get and stay trim. A new bike is also in the works. REIs Novara Randonee looks like the one. Trek's 520 and Fuji's touring bike, and lastly the Bianchi Volpe, are also outside possibilities. It will be steel and it will be a touring bike. The touring bug has bitten and the virus is dormant for now but no doubt will re-emerger in the spring. Unless things change, one of the rides next summer will be the Erie Canal towpath from Buffalo to Albany. That can be done by taking a minimum of vacation days bracketing a weekend. A motel tour, carrying a tent just in case. An Arab and a Jew open restaurants across from the UN...... It's not the opening line of a joke, but the book is as funny as your imagination takes you from the line. 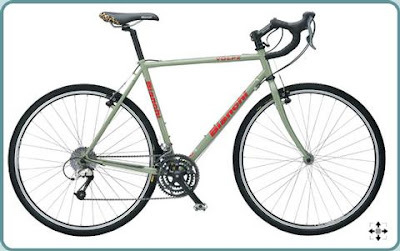 I encourage you to buy the Bianchi if only so I can vicariously live the Bianchi lifestyle through you. I can't afford another bike, but I bet it would be a great bike. That said, the REI may be more of a touring setup. Yeah, for me it's had to be a combination of riding, running & weights. While I can't run the distances I used to, I still find that even a light 5k on the treadmill really burns the calories. Funny thing about this post. 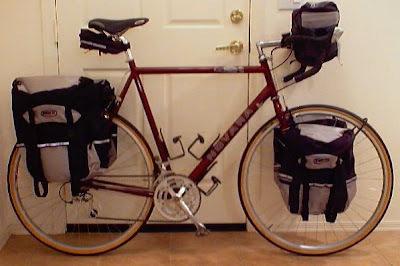 My next bike will also be a touring bike. I have two bikes in mind. The cheaper option is a Surly Long Haul Trucker. The more expensive option is a Rivendell Atlantis. ....and I've read all of Tom Robbins books. Love them all! Probably my favorite author of all time. I've lost a lot of weight through cycling, but I've also changed my diet. Although I've been sticking to the diet less lately and my weight has stopped dropping. I've suddenly gotten more dedicated to commuting for some reason. I guess because it's been cold and rainy it's seemed like a fun challenge somehow. I don't really understand it myself. At the same time, I have not done a single non-commute ride so far this week and it's driving me nuts. Those are some great bike options. 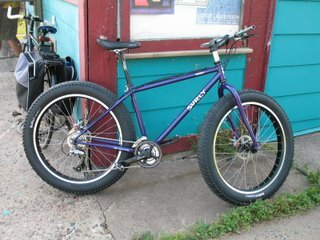 I'm thinking my next bike might be a touring bike or a cross bike, maybe a Soma Double Cross, Surly Long Haul Trucker or maybe a Surly Cross Check. I'm sure there are other options -- I try not to look since I'm not in the market. Of the bikes you mention, the Novara and the Fuji look most appealing to me although that Trek is pretty sweet too ... I don't think you can go wrong with options like those. If you're looking for a ride partner for some or all of that Erie Canal ride next year, drop me a line. "Nothing To Lose But Our Chains!" Don't forget the new Surly Travelers Check frame. May be a better Touring set-up.